Carter Kieboom’s fourth single of the afternoon yesterday put Salt River on top, 4-3 and on the verge of snapping a three-game slide. Instead, the Rafters channeled the 2018 Washington bullpen for the third time in four games and coughed up the game-winning runs for a 5-4 loss to the Javelinas to extending their losing streak to four. Kieboom, who would finish 4-for-5 with a run scored and an RBI, had started the game at shortstop and batted third. He also committed his fourth error of the fall. Tres Barrera also started—catcher, no. 5 in the lineup—and drove in a run, but was just 1-for-5 and grounded into a double play. Daniel Johnson was the third Washington prospect to appear in the game, batting behind Barrera in the sixth spot and in left field. Johnson also committed an error and was hitless in his third straight game. He drew a walk, but was unable to show off his basestealing skills. Salt River got the benefit of a Mesa loss to remain 1½ games up and in position to play Peoria this Saturday with a magic number of two. 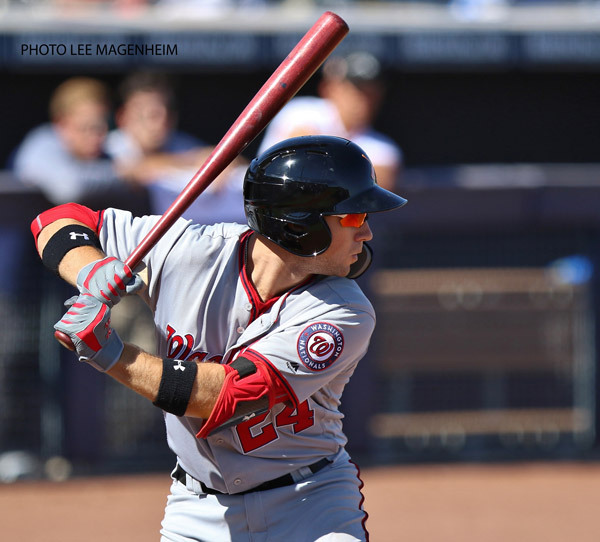 Do the Nats keep Carter Kieboom close by in Harrisburg or send him to Fresno? History says Harrisburg since he didn’t arrive there until July last year. I don’t think it matters much in the end. The Nats regularly promote prospects directly from AA, so keeping him in Harrisburg doesn’t indicate that they think he isn’t ready. I’d personally rather they kept him in the Eastern League, but either way I hope we get a glimpse of him in DC before the ASB in 2019. Carter Kieboom leads the AFL in walks. While he hasn’t shown all that much power (only a .084 ISO), he’s walking more than 17% of the time, and very nearly has as many walks as strikeouts 15:17.